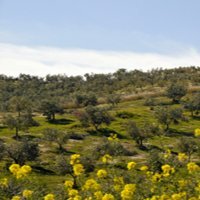 A Guide to Andalucia and Surrounding Cities. The Best place to visit in Spain. Take the best trip to Spain! 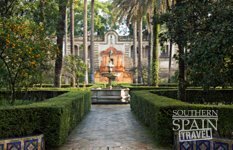 Flamenco, bullfights, jerez sherry, olive groves, windmills, castles, Seville orange trees, siestas… all things that come to mind when we think of southern Spain- the most beautiful area of Spain. 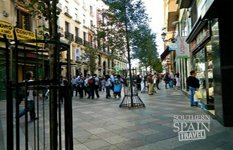 Southern Spain Travel.com, an independent travel website, will give you everything important for visiting the key, must see cities. Insider tips, hotels, restaurants, tour informaiton and an overview of each city. 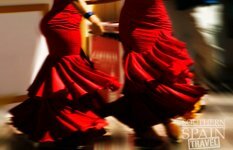 Travel to Spain with our advice and have a great time! Don't get us wrong, all spanish cities are pretty cool. But we think the best are located in the south region, most of which is in the state of Andalucia. There's a special charm and magical presence that envelops you when you're here. In no particular order, here are the key places to visit in southern spain travel-ing. Granada - Located at the foot of the Sierra Nevada mountains, it's home of the Alhambra Palace. 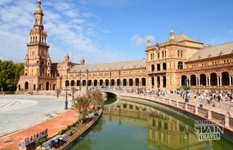 Seville - Also called Sevilla, known for its charming nature and moorish influence. They have a wonderful Alcazar, Cathederal and have the best Semana Santa (easter week) and La Feria (spring fair) in the country. Malaga - A key beach going town on Costa Del Sol, east of Gibralter, it's the birthplace to Antonio Bandera and Pablo Picasso. They have a subtropical mediterranean climate. The town has remains of a roman theatre and ancient phoencian wall. Cadiz - Gorgeous beaches, this shore town boasts the title of Europes oldest city. 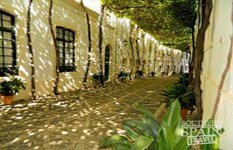 Jerez de la Frontera - Sherry country, outstanding Bodegas are here, and home to "Tio Pepe" and the Gonzalez Byass winery. Cordoba - Located on the Guadalquivar river this must see town boasts roman history, moorish sytle patios and a magnificant mosque, the Mezquita. Ronda - A gorgeous and charming white hill town with an amazing gorge. Home of the oldest bullring in the country. There is no trip planning anxiety here! Believe me, there’s a lot to do, but we’ll boil it down to just the top of the list. We will guide you to the best! 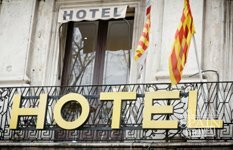 So whether you are going to stay for one night or ten, you'll need to know the best options for your trip to Spain. If you rather have a planned tour, we've got info on that too. It's certainly the easiest way to go as it requires minimal planning beforehand.﻿ Here is a quick overview. The hotels in the south region are so charming. 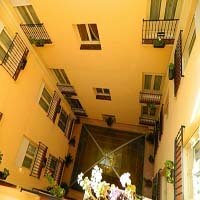 You'll get the best experience if you stay in a locally run establishment in the heart of the city center. They are simple, but make you feel like a local! If you prefer luxurious accommodations, you'll find some great picks. Many Spain hotels provide free breakfast and this creates a great start to your day. I could go on forever about Spain's food. They seem to have quite the knack for the best small dishes that not only satisfy but are pleasing to the eye. My favorite tapas include tortilla de patatas and gazpacho, Andalucia's regional must-have's. 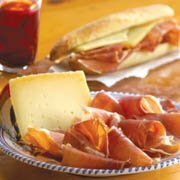 Adam loves the Jamon Serrano with a nice glass of Sherry from Jerez de la Frontera. While I find the shopping a bit expensive at times, I enjoy the unique style that the Spaniards have. I love the way they pair thier clothes together and I always find myself looking for something special to take home. You'll find the greatest boutiques full of gifts for your friends and family, and to really treat yourself to something special. From food to stylin' shoes, you'll find it all in the center of town. 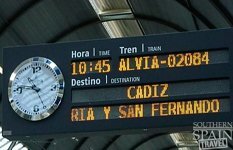 There are enough things to do and attractions to fill numerous days of your southern spain travel trip. The Moorish and roman influence from the past reflects on the current cities today. The amazing cathedrals, palaces, roman ruins and gardens are something that is not to be missed. The flamenco shows are so fun. You feel the passion these dancers and musicians have from just a few feet away. And let's not forget, the flamenco garb is something spectacular as well. From the hair to the shoes, it's quite magical. 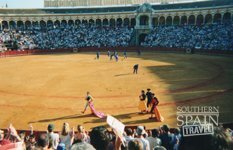 No matter what your feelings are on bullfighting, you have to respect the culture and history behind it all- It's pretty amazing! Be sure to tour the bullring museums to see the Matador's outfits. And if you can catch a show, you won't regret it. Don't be afraid of the train travel and taxi's. The Ave is the best train ever. Clean, neat and you can even get a snack, it's definitely our preferred method of travel. Spain buses are great too. If you prefer to rent a car, the big international chains are available at numerous locations and we have never had an issue renting a vehicle from them. Even the small companies are reputable! If you are coming to this region, be sure to look into taking a trip to close surrounding cities. It's easier then you think to get there, and you'll be amazed at what you find. There’s so much to experience in this beautiful country. We happen to think it’s one of the most exciting places to visit and wanted to share our experiences with you. Let your trip in Spain begin with Southern Spain Travel! 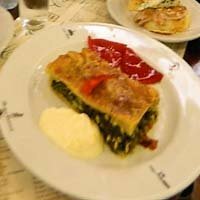 Take a look at the meals we’ve enjoyed and restaurants we recommend. Traveling to the south making this region your hub, with day trips to other towns? Curious What it Looks Like? We'd love to see where you've been and what you recommend.